If your doctor has decided to prescribe CRESTOR® (rosuvastatin calcium), or you’re already taking it, you could be eligible for a savings offer. For details on these savings offers for CRESTOR and to find out if you are eligible, see details below. As low as $3.00 for up to a 3-month supply! To start saving if eligible, register to access and print your CRESTOR Savings Card. Then, take your Savings Card with your prescription to the pharmacy and present it to your pharmacist. If already registered on CRESTOR.com, or if you choose not to sign up at this time, you can download your card right away. 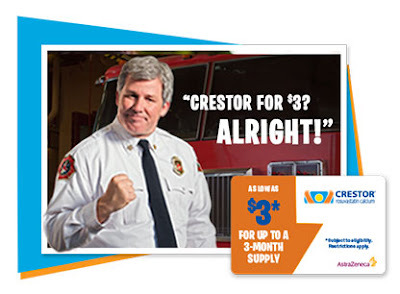 Register on CRESTOR.com from your mobile device to download the AZhelps Savings Card through Apple or Google Wallet. *Patient Eligibility for Savings Card: You may be eligible for this offer if you are insured by commercial insurance and your insurance does not cover the full cost of your prescription, or you are not insured and are responsible for the cost of your prescriptions.